THE MYSTERIOUS BLUE WATERMELON (PART 2) - What About Watermelon? Last week, I wrote about my search for a blue watermelon, based on a reader question. Although the search was fruitless (yielding only one suspiciously doctored looking photo), I did also manage to find the striking photo above. Unlike the photo from the previous entry, this one is on-the-record as being doctored. What a shame. To bad it was doctored, it sure looks good. It is a shame too. 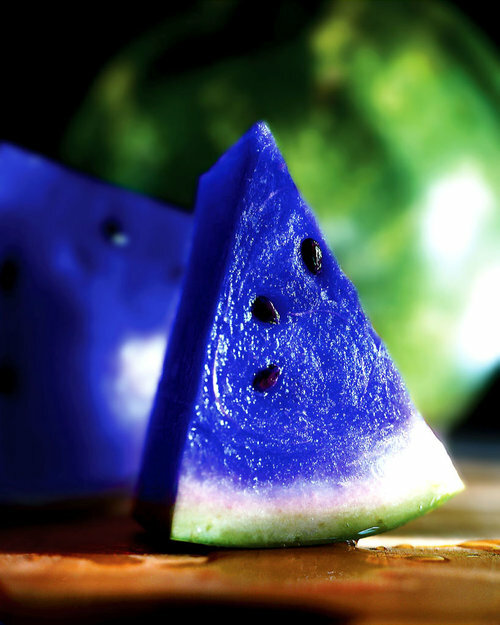 Maybe someone’s scientific juices have been stirred and they will start experimenting on producing a blue watermelon. Time will tell, hopefully. I’m holding out hope for a watermelon that changes colors like a mood ring or one of those gobstoppers that have different colored layers. Look at the seed closest to the bottom. It does look a bit reddish, doesn’t it? We have a watermelon in our garden this year that is blue on the outside! This is a real surprise. Anyone ever heard of this? I have heard of yellow and orange watermelons, I have tasted them myself. They taste about the same. To the person that said that the blue watermelon is the Moon & Stars Watermelon (sam j, that would be you): http://www.burpee.com/fruit-plants/melon/watermelon/watermelon-moon-and-stars-prod000559.html It is not called the Moon & Stars Watermelon because it makes a blue interior. It says right by it that the flesh is a deep red. It just has a spotted exterior.